Ugh. An awful-statted character in general, and the fact you have to resource another Zoog in order to actually use it makes it worse. It can bounce around the amount of resources on different domains, but it's more fiddly than it's worth by a long shot. Is it me or are Zoog decks just looking like ways to do a lot of stuff and have a long turn without actually achieving anything? OK, a bit of resource ramp for this one as long as you have a Zoog in play. Feels like a lot of work for little reward. 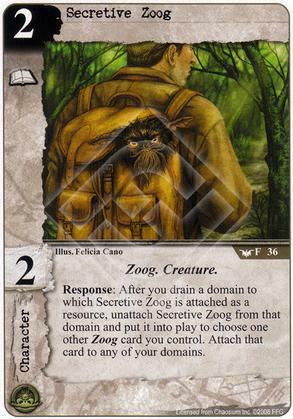 So if I get Control of my opponent's character, use false papers to give him the zoog subtype and then use this ability I can turn my opponent's character into my resource. What an interesting but pointless combination, but why else would I ever consider running this card?